We spent this past weekend at Otey’s parents house celebrating an early Thanksgiving. We will be in Indiana on Thursday, so it was good to spend a couple of days hanging out with his family in southern Missouri… eating… and eating… and eating. Did I mention we did a lot of eating? Well, the grown-ups did a lot of eating, and the kids? The kids did a lot of running, yelling, and pretty much just partying hard. Otey’s Mom really wanted a picture of all four of her grandkids in the same shot. I told her I would try as long as she had realistic expectations. I mean we are talking three WILD little boys and one sweet one. When I deliver baby version 3.0 in January, Otey’s parent’s will have five grandsons under four. Can you imagine what holidays are going to be like at their house in a couple of years? So anyway, this is about as good as it gets with a 3.5 yr old, 2.5 yr old, 1.5 yr old, and a (did I mention sweet?) almost 1 year old. I think this was the second frame I shot and about 6 seconds later Grady was done. Arched back, get your frickin’ paws off of me Cooper… done. And sweet baby Jasper? He would have been hitting the road with Grady if only he could walk. 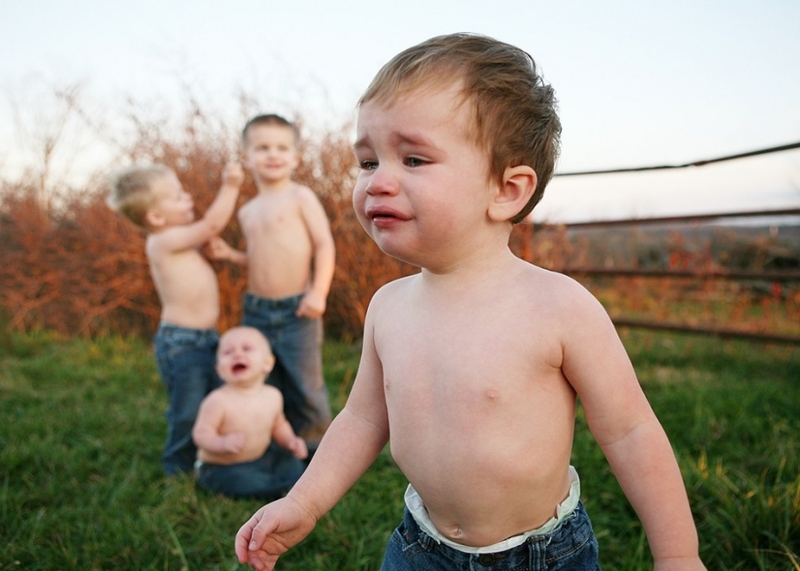 Instead he was left to scream for help while Cooper and Cole stuck grass in each others ears. Cole and Jasper belong to Otey’s little brother Ben and his wife Brandy. I forced them into an unplanned family photo. Ben with his deer hunting beard and Brandy… who am I kidding, she always looks photo ready. The forty-three second shirtless photo shoot somehow led to a spontaneous bathtub party. Cooper and Cole were WILD… a good Mom wouldn’t have let a kid Grady’s age in their with them. There goes my Mom of the year award. The plan for Sunday morning was to get all the kids dressed and ready and try again to get all four of them in some photos. TRY is the key word here. We missed the “happy kid” window. Grady and Jasper were ready for morning naps, Cooper and Cole were once again (you’re never going to guess) WILD. I did catch a few of them around the house before we headed out to the barn. For my photog friends… no dodging no burning. Do these boys have killer eyes or what? Otey and Ben somehow got stuck in the middle of the photo shoot when they were really in the middle of working (notice their nice boots). Grady is still trying to get it together from the breakdown he just had at the end of trying to shoot the four boys (that’s why he has his binky). And Ben is smiling like that because he knows his sister-in-law with the camera is leaving town as soon as we get this photo over with. Oh, and Jasper? I’m sure he’s just seconding what his Dad is grinning about. Moral of this story? If you have four kids 3.5 and under that you would like a photo of? Call me in three years. 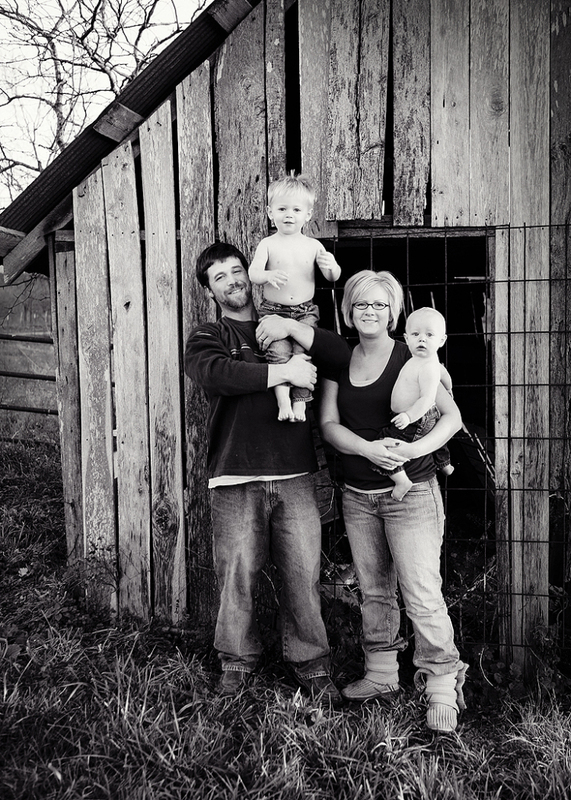 Emily - Love the ranch pictures, the boys are so cute and are getting so big! Mary Kay - Those are sure some cute guys! Kayla - This is great! i love it! 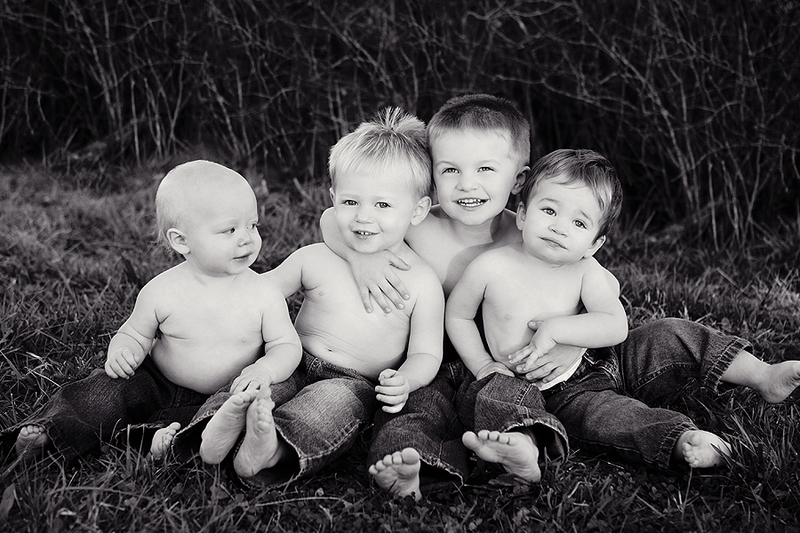 that first pic of the 4 little ones is to die for! how much fun! maybe it is chaos for the photographer but its fun for your fans to see these pics for sure!!!! Collyn Ware - Oh my!!!!! This is craziness; the most cute craziness ever!! The first picture is wonderful! Nate and I have talked about another child next year. I can see what I am in for!! !